A European species, occasionally escaped from cultivation to roadsides, fields, dumps and gravel pits, disturbed ground. First collected in 1884 in Keweenaw Co. 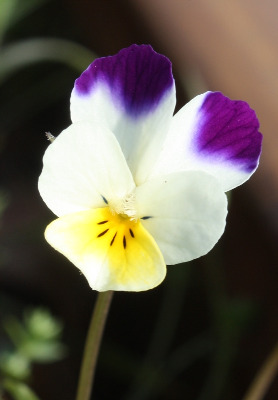 This species looks like a miniature pansy, and indeed it is one of the parents of the garden pansy, V. ×wittrockiana Gams, which may persist briefly after cultivation. The flowers are generally at least 1.5 cm long, whereas in V. arvensis they are less than 1.5 cm. They are also small in V. bicolor Pursh (V. rafinesquii Greene), but its petals are much longer than the sepals, unlike V. arvensis, and the upper leaves as well as the large terminal lobes of the stipules are entire or nearly so (rather than crenulate as in V. arvensis and V. tricolor). Viola bicolor has sometimes been reported from Michigan, but no specimens have been found, though it occurs as close as the Erie Islands of Ontario. MICHIGAN FLORA ONLINE. A. A. Reznicek, E. G. Voss, & B. S. Walters. February 2011. University of Michigan. Web. 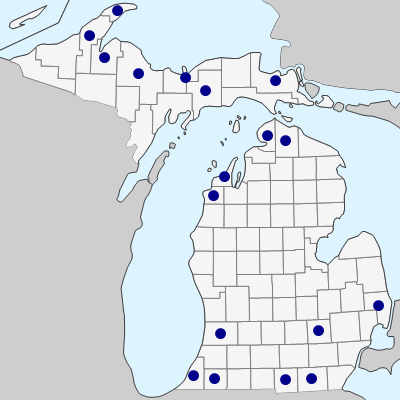 April 21, 2019. https://michiganflora.net/species.aspx?id=2800.